f. is for frank was established in 2007 and is a collaboration between Shoshannah Frank and Casey Melton. 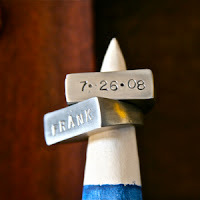 In 2009, the duo decided to take a departure from designing custom architectural elements and created a line of jewelry. f. is for frank’s handmade collection of jewelry has a textural, sculptural and modern feel that is derived from the artists’ background in designing and manufacturing architectural elements. While their jewelry reflects organic shapes and objects in nature, they also enjoy making a huge statement with scale. This statement ring allows you to say whatever you want! 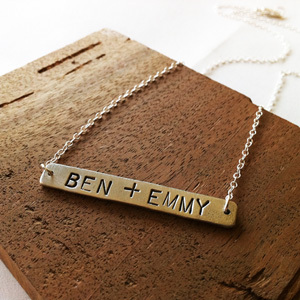 It includes a custom hand stamped date, name or word (maximum 10 letters). Examples: (pronounce your love (A+C), wedding date (7.1.06), son or daughter's name (WALKER), new last name (MRS. MELTON) or status (SINGLE)....say what you want! Another way to say I Love You! The pewter plate is 1 3/4 long and 3/8 wide. When ordering, please include the names you want stamped on the front in the comment section. Want to include a message on the back....like a date? Add handstamping for just $10!